yourFXguide-Every traders needs to have a reliable tested trading system. Choosing the trading system greatly depends on the trader types. Some traders are patient and they love to place an order with a long term trading system, and place orders when the entry is confirmed by the long term trading system. Impatient traders love to place orders frequently and participate in all market moves. 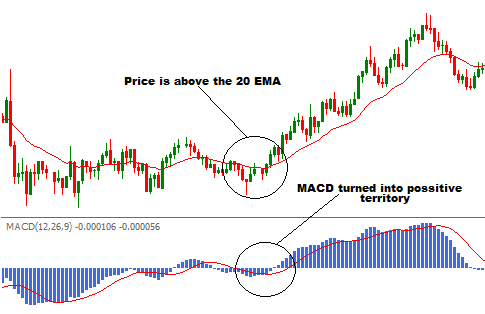 This trading system is for the traders who trades frequently on shorter time frame chart. 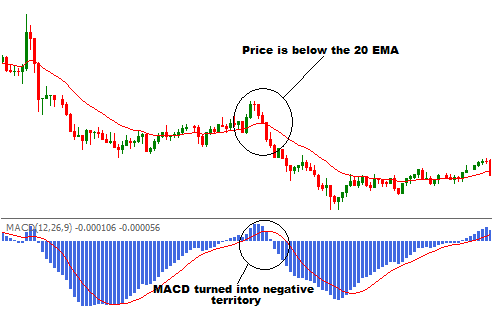 In this trading system we will have 20 period exponential moving average (20 EMA) and MACD histograms (first EMA = 12, second EMA = 26, Signal EMA = 9). The trading system should be applied on 5 minute chart. The price should be above the 20 period exponential moving average. MACD histograms should be turned into positive territory or in the process of crossing the zero line from below. The stop loss for a long entry should be either the previous swing low or 20 pips below the 20 period exponential moving average. The price should be below the 20 period exponential moving average. MACD histograms should be turned into negative territory or in the process of crossing the zero line from above. The stop loss for a short entry should be either the previous swing high or 20 pips above the 20 period exponential moving average. Dear Traders, If you have any question regarding this post, you can drop it into the comment section below.